Made in the USA with innovatively engineered geometries, RobbJack delivers unparalleled performance. Click HERE to find a distributor in your area. Many companies struggle with machining of new composite materials. Common problems are poor tool life, delamination of layers, and long cycle time. The first thing to remember is that all composites do not act the same. There is no one all encompassing solution for all of the types of composites out there. Depending on material characteristics, some tools might work better than others. Fiber orientation, prepreg, or the distance the weave of fiber is away from the top or bottom of the surface. The greater the distance, the less problems you have with uncut fibers. Rigidity of the work piece is one area that is often over looked in optimizing composite machining. When the part is vibrating tool life will suffer. The more rigid the work piece is the longer the cutting tools will last and the more predictable the tool life will be. Speeds and feeds can also be increased if the part is very stable during cutting. The most common fixturing is vacuum fixtures. The closer the fixture matches the part the greater the rigidity. Many companies invest time in maximizing the rigidity of their fixtures at the beginning of a run. This usually pays large dividends with repeatability, quality, and consistency. Some tips and trick do not have to always be high tech. You can use something as simple as laying sand bags in unsupported areas of the part to help dampen vibration. Some people use tape to help secure families of parts that do not match the fixturing as closely as others. Anything you can do to get rid of vibration will help. There are three common types of drills. Solid Carbide, Diamond Coated Carbide, and PCD drills. Each have their place. Carbide drills are usually only used for manual operations because of their poor tool life. Both diamond coating and PCD are the drills of choice for most applications in abrasive composites like carbon fiber. Diamond coating is Excellent for drilling! In some applications you can even increase tool life over PCD drills. Many tool tip geometries are available 8 facet double angle, traditional 4 facet, and elliptical points are all easily made to help reduce delamination. When you choose diamond coated tools you have to make sure the carbide grade is compatible with diamond coating. You need to make sure to use 6% cobalt content carbides so graphite is not formed before the diamond starts to grow on the tool. When using diamond coated drills they are disposable tools. You can use them until they wear out and you cannot resharpen them, sometimes this is easier to deal with than keeping track of re-sharpening programs with PCD cutters. PCD drills are an excellent choice for drilling in CFRP materials! The PCD tools tend to outperform the diamond coated drills in materials with high plastic content because they can maintain a sharper cutting edge. New tip geometries and solid PCD tips are now available that until recently were only available in carbide or diamond coating. These new tip geometries help reduce many of the problems associated with drilling composites. 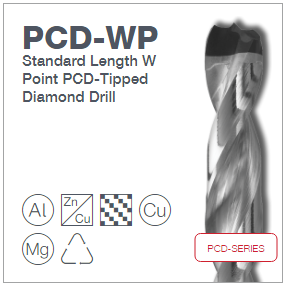 PCD drills have the advantage that they can be resharpened unlike the one time use of diamond coated drills. The disadvantage is the initial cost of the PCD drill is typically higher than that of the diamond coated drill. Many tools have been developed specifically for composite materials. A few of these tools have save thousands of hours and millions of dollars over the old way of cutting composites. Here are a few, Specially designed and diamond coated dovetail cutters designed to cut the bevel and trim when necessary allows the part to match the CAD model and eliminate many secondary or third operations. Dual purpose reamer counter sinks are used using micro stop hand tools to finish the hole size and counter sink in one operation. The tool is a solid carbide one piece design so it can be diamond coated unlike most brazed threaded tools. Another time saving style of tool is a perforation tool used for sound reduction parts where thousands of holes are needed. One tool can reach up to 80,000 holes in fiberglass and up to 40,000 holes in carbon fiber. If you have an un-rigid machine or poor fixturing usually you will rough with carbide and then come back and finish using PCD taking a shallow radial width. Typically, carbide tools are used in a grinding type of action. A common mistake is to run PCD the same way. Running PCD the same way as a carbide burr style tool is very common and usually results in excessive heat on the PCD cutter and premature failure of the PCD. The advantages of carbide is it is readily available and is relatively inexpensive. The down side is the tool life is very poor and can result in damage to very expensive parts. If the part can be fixtured better, it is recommended to just to go in with PCD and trim the part in one pass. If the material is not too difficult to cut you can use diamond coating in trimming operations but PCD is more resistant to chipping. Diamond coating can be a little more wear resistant than PCD so if the part has a lower plastic content than diamond coated tools may last longer than PCD as long as the material does not cause delamination of the diamond. If for some reason the part needs to have a compression design or needs specific geometries unable to make with PCD diamond coating might be the way to go. The most successful tool we have used for trimming CFRP materials is PCD. Most failures we have seen with PCD is misapplying the tool. It is very important to use the proper speeds and feeds. If the part is well fixtures PCD is used to rough the part and finish it in one pass right to net shape. If the part does not have the best fixturing PCD trimming tools are used for finishing. PCD trimming tools seem to be the best trimming tool for most materials especially in the higher plastic content CFRP materials. We have customers getting up to 14,000 linear inches or tool life in CFRP.